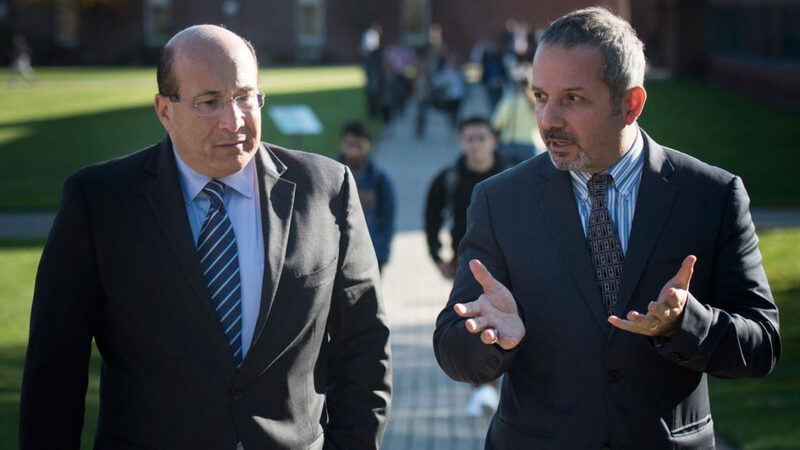 Osman Kilic of North Haven, right, professor of finance and director of the Alternative Investments Institute at Quinnipiac University, chats with Ron Insana, a contributor to Comcast NBCUniversal’s networks CNBC and MSNBC, during Insana’s Nov. 16 visit to Quinnipiac University. Photo by Autumn Driscoll of Quinnipiac University. “This is an extremely exciting time and there’s no reason to feel downbeat,” said Insana, who delivered the talk, “The Economy, The Markets and the Next President,” in the Mount Carmel Auditorium at Quinnipiac. “One single election outcome isn’t going to derail the technological progress that’s being made in the United States. The opportunity is there and your skillset is there. Markets will go up and down. This is just the ongoing sweep of history.” Insana spoke at the event, which was sponsored by Quinnipiac’s School of Business and Comcast. He added that trade wars with China and Mexico could create a global recession. He advised students remember that the future isn’t certain, no matter how much you plan. Insana is well-known for his high-profile interviews, which included Presidents Clinton and Bush; billionaire investors Warren Buffett, George Soros and Julian Robertson; captains of industry Bill Gates, Jack Welch and the late Steve Jobs; and heads of state, former Soviet leader, Mikhail Gorbachev, and Jordan’s current Queen, Rania.